Dan and I made it to our last stop this summer before we go back to school at the end of August. Philadelphia! We got here a week ago and have been able to see some of the sites so far. We drove to Alabama from Georgia so we could fly out of Birmingham. Before Alabama, we hadn't found any restaurant that we absolutely love. Usually we ask the hotel manager or the Daycare directors what the best place to eat is in each city. To be honest, I like my mom's home cooking way better than any place we have been. But, in Birmingham we went to the best barbecue! 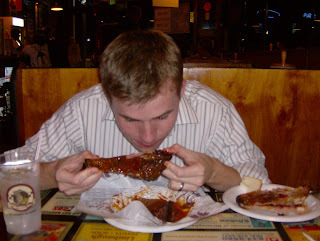 Barbecue is Dan's favorite, and he gobbled down like 6 ribs in 10 minutes. So if any of you are ever in Birmingham Alabama, you have to go to Dreamland's Barbecue. Their slogan is "There ain't nothin like em nowhere!" 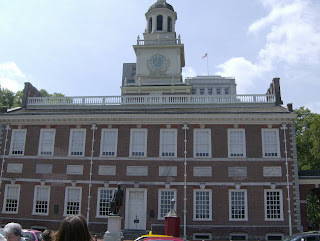 So our first day in Philadelphia we went to see the famous liberty bell and independence hall. The Liberty Bell is a lot smaller than we imagined. We have yet to find the Rocky steps, but when we do, I will post some pictures. We spent quite a bit of our time this week lost in the ghetto of Philadelphia. And when I say ghetto, I mean the whole city! There is garbage, run down old apartments, and bums EVERYWHERE you go. After I got done with one review, the man in charge of the daycare came out side to watch me walk to my car at three in the afternoon! The streets are really confusing here as well. East coast drivers really are crazy. And you can't get out of the car and ask for directions, or you might get shot! At the end of this week, Dan and I convinced our boss to let us buy a GPS. It has been really nice! Yesterday Dan and I drove to Hershey Pennsylvania to see the place where all of the chocolate is made! 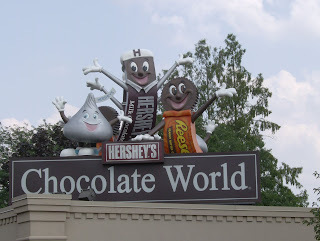 We took a tour to see how Hershey makes all of their chocolate, and went to the Hershey museum. It was a cute little town with street names like Cocoa and Chocolate Avenue. Next weekend we are going to go to Washington D.C. and see the sites. It is crazy how fast this summer has gone by! Yummy! That looks like so good BBQ. I think you guys have such a fun job being able to see all of the sights you have. But, be careful, we don't want you to get mugged! Yes, I have heard Dreamland BBQ in Birmingham is great. Though I haven't had a chance to eat there. I was just there and I ate at Highlands and the Hot & Hot Fish Club. Both were great. I also recently had a great time eating my way through Philadelphia too. Sounds like we are living parallel vacations! luck you ! i wish I could go to the place where they make chocolate. Sounds like you're having fun! I could die and go to heaven in Hershey PA, that is hands down my favorite milk chocolate! Sounds like you're having fun and eating well! 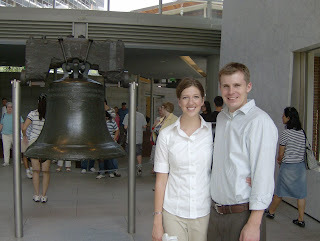 The liberty bell is small! I can't believe it. My mouth started watering when you were talking about the BBQ, that sounds so yummy right now! I can't believe that you are in such a scary area, be careful, I need a cousin ya know! ha! Love ya!